The Tan Quee Lan Street GLS tender launch is expected to set benchmark land pricing for a residential site the area, say real estate stakeholders. The Urban Redevelopment Authority (URA) today (March 29) launched a residential with commercial at 1st storey site at Tan Quee Lan Street for sale by public tender today under the Confirmed List of the first half 2019 (1H2019) Government Land Sales (GLS) Programme. 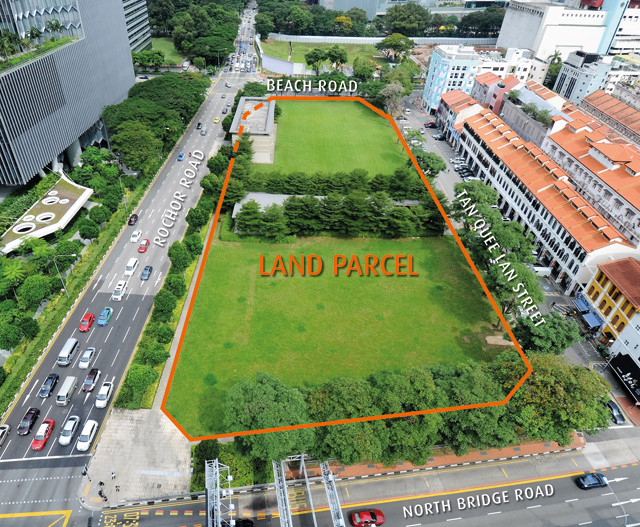 The Tan Quee Lan Street GLS tender site can potentially yield up to 580 residential units. URA further said that the tender for the residential site at one-north Gateway, which was originally scheduled to be launched via the Confirmed List of the 1H2019 GLS Programme in March 2019, will be re-scheduled to June 2019 to facilitate a review of planning parameters and tender conditions for the site. The land parcel of the Tan Quee Lan Street GLS tender site is located within a vibrant mixed-use district, surrounded by key commercial developments, hotels, retail malls and educational institutions such as South Beach, Raffles Hotel, Bugis Junction, National Library, the Singapore Management University and LaSalle College of The Arts. The Tan Quee Lan Street GLS tender site is located next to Bugis MRT Station, which is a rail transit interchange between the East-West Line (EWL) and Downtown (DTL) Line. It is also conveniently linked to other parts of the island via the nearby Nicoll Highway and East Coast Parkway. (1) Site area subject to cadastral survey. (2) Computed from the date of acceptance of the tender by the Authority up to date of issue of Temporary Occupation Permit for the whole of the proposed development. The tender for Tan Quee Lan Street site will close at 12 noon on 5 September 2019. URA said that the tender closing for this site will be batched with another site at Bernam Street which is scheduled for sale in May 2019 under the 1H2019 GLS Programme. Commenting on the Tan Quee Lan Street GLS tender announcement, Colliers International said it expects the tender to set benchmark land pricing for a residential site the area in view of the plot’s superior city-centre location and good connectivity, being on top of the Bugis (Downtown Line & East-West Line) MRT interchange station. Colliers noted that the Tan Quee Lan Street GLS tender site will not be subject to the rule on minimum unit size as it is located in the Central Area. Colliers projects that the Tan Quee Lan Street GLS tender site could attract 10 or more bidders, with a potential top bid of SGD834 million, translating to SGD1,600 per square foot per plot ratio (psf ppr). According to the URA, about 580 residential units can be built on the site. The serviced apartment GFA shall not exceed 14,530 sq m. A maximum of 2,000 sq m of the total GFA of the development may be developed for the following commercial uses at the 1st storey.